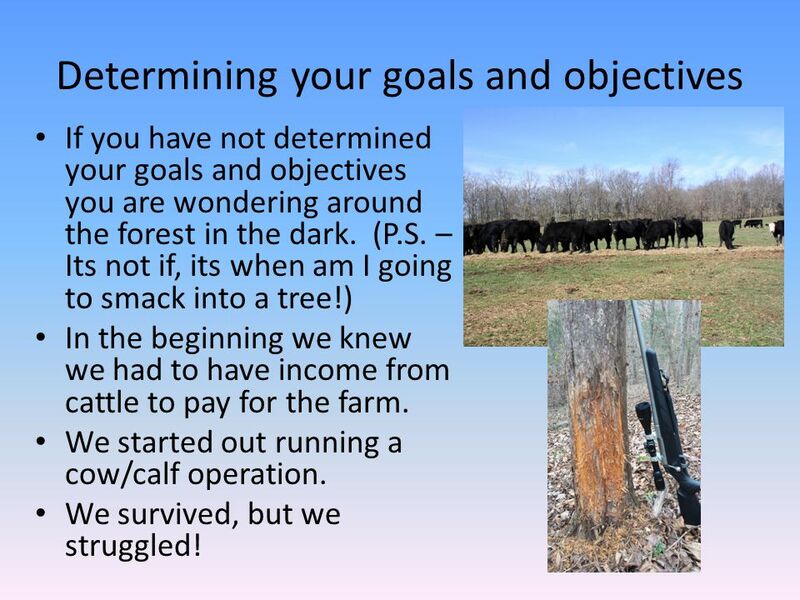 If you have not determined your goals and objectives you are wondering around the forest in the dark. (P.S. – Its not if, its when am I going to smack into a tree!) In the beginning we knew we had to have income from cattle to pay for the farm. We started out running a cow/calf operation. We survived, but we struggled! We had trouble harvesting enough hay. We had trouble with Bull management. We had trouble calving. We had trouble with working cattle and facilities. We had difficulties with our hunting strategies. It was time to come up with a new game plan! In discussion we determined the main reason for the purchase of this farm was to have a place of our own that our families could grow up hunting and spending time outdoors. 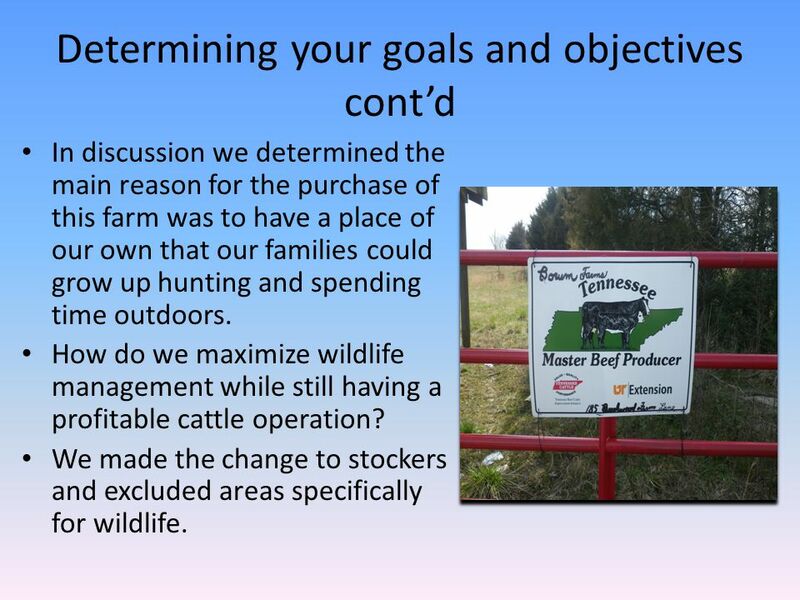 How do we maximize wildlife management while still having a profitable cattle operation? We made the change to stockers and excluded areas specifically for wildlife. 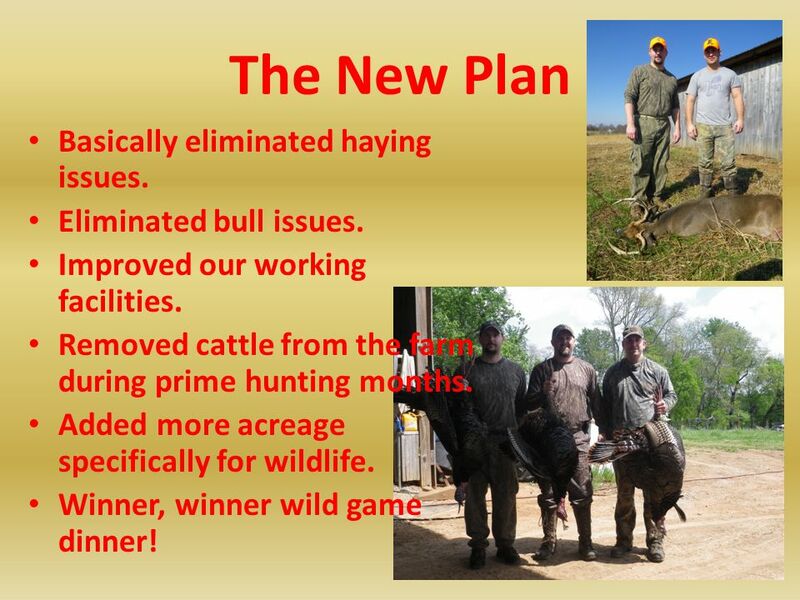 6 The New Plan Basically eliminated haying issues. Eliminated bull issues. Improved our working facilities. Removed cattle from the farm during prime hunting months. 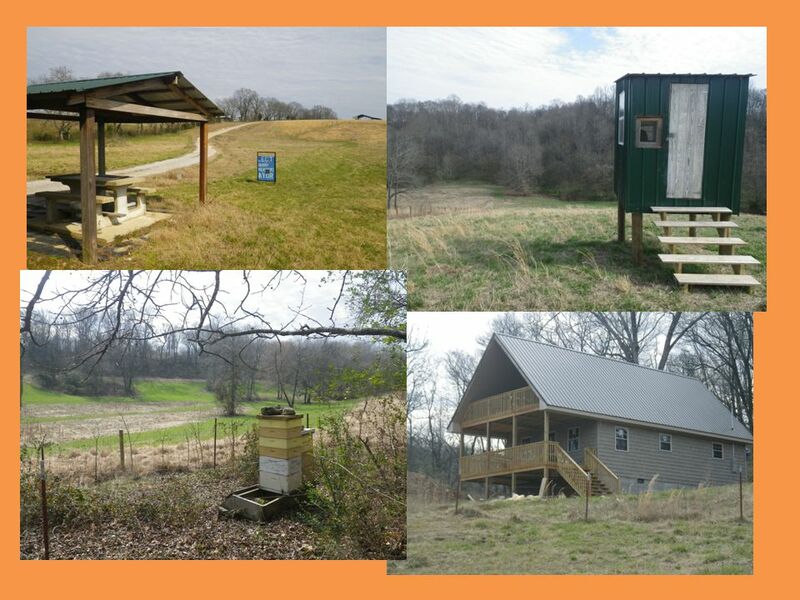 Added more acreage specifically for wildlife. Winner, winner wild game dinner! Once goals are determined the layout and design phase are critical to success. 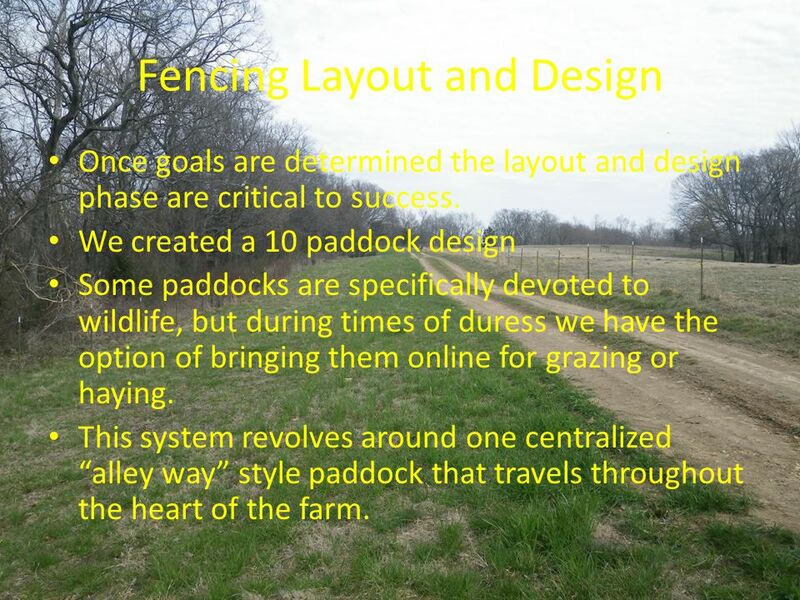 We created a 10 paddock design Some paddocks are specifically devoted to wildlife, but during times of duress we have the option of bringing them online for grazing or haying. This system revolves around one centralized “alley way” style paddock that travels throughout the heart of the farm. 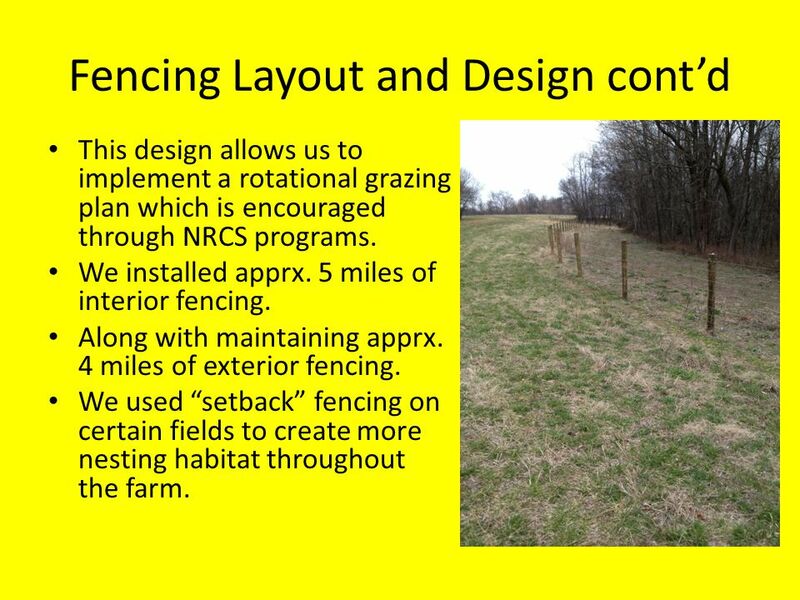 This design allows us to implement a rotational grazing plan which is encouraged through NRCS programs. We installed apprx. 5 miles of interior fencing. Along with maintaining apprx. 4 miles of exterior fencing. We used “setback” fencing on certain fields to create more nesting habitat throughout the farm. 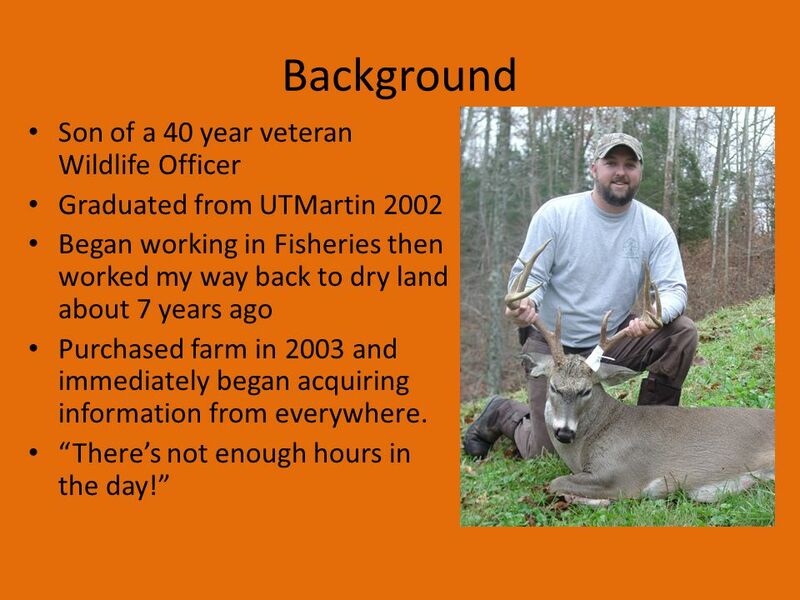 First identify the limiting factors to wildlife. Lack of good early successional cover. (Good nesting and bedding cover) Increase amount and quality of food sources. We planted a mixture of native warm season grasses and forbs. 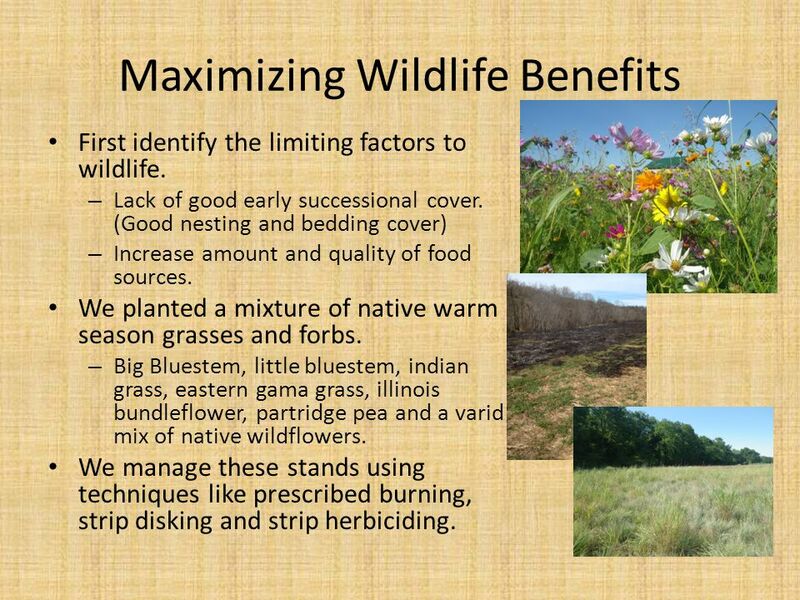 Big Bluestem, little bluestem, indian grass, eastern gama grass, illinois bundleflower, partridge pea and a varid mix of native wildflowers. 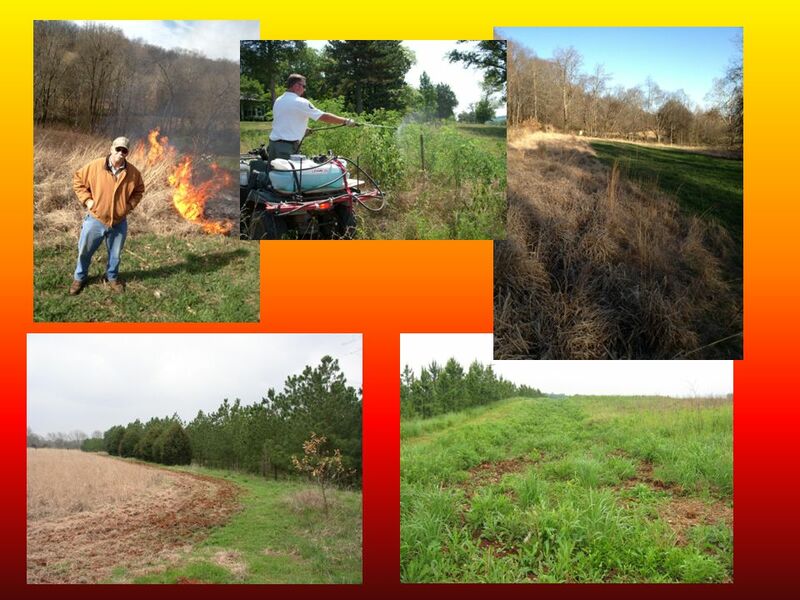 We manage these stands using techniques like prescribed burning, strip disking and strip herbiciding. We expanded on existing fruit trees on the farm and created an orchard. (Apple and pear trees) We planted numerous species of mast producing trees. 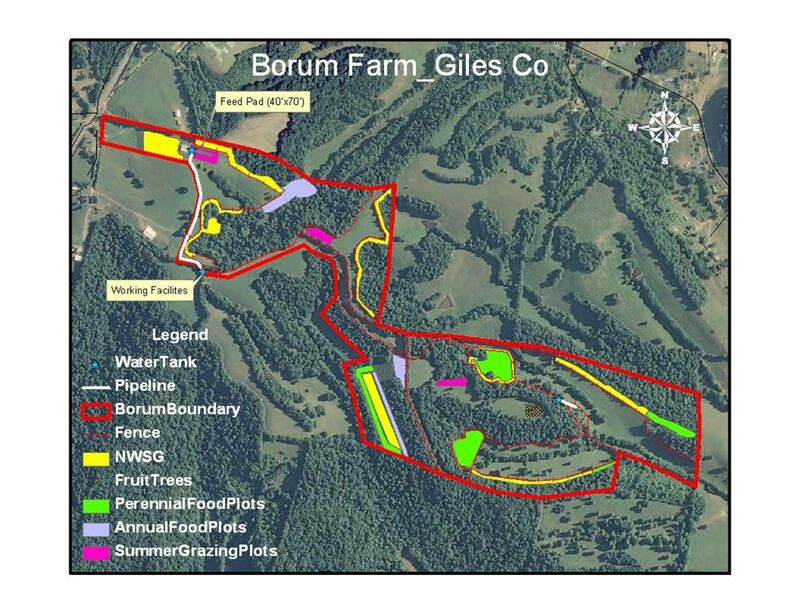 (Sawtooth, white oak, red oak, American plum, Southern crabapple) We integrated throughout the farm a total of about 15 acres worth of perennial and annual food plots. Annual plots consisted of corn and beans. Perennial plots were a mixture of red, white and crimson clover along with wheat and oats. Installed three alternative watering sources along with digging a pond and using natural springs on the farm. Built all new working facility. Added hay storage capacity. Installed heavy use concrete feed pad. Pasture renovations. Began drilling wheat and oats in most paddocks in the fall. For early spring grazing. 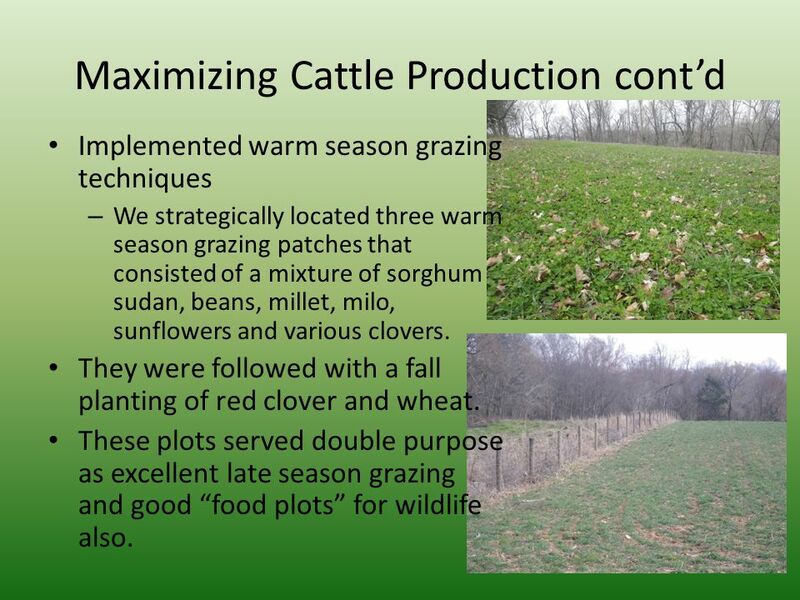 Implemented warm season grazing techniques We strategically located three warm season grazing patches that consisted of a mixture of sorghum sudan, beans, millet, milo, sunflowers and various clovers. They were followed with a fall planting of red clover and wheat. These plots served double purpose as excellent late season grazing and good “food plots” for wildlife also. We used every acronym in the book. 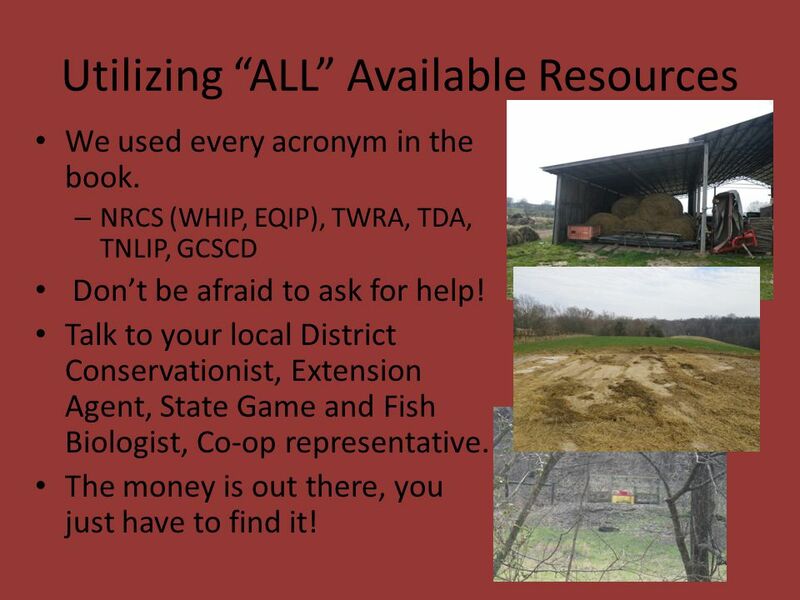 NRCS (WHIP, EQIP), TWRA, TDA, TNLIP, GCSCD Don’t be afraid to ask for help! 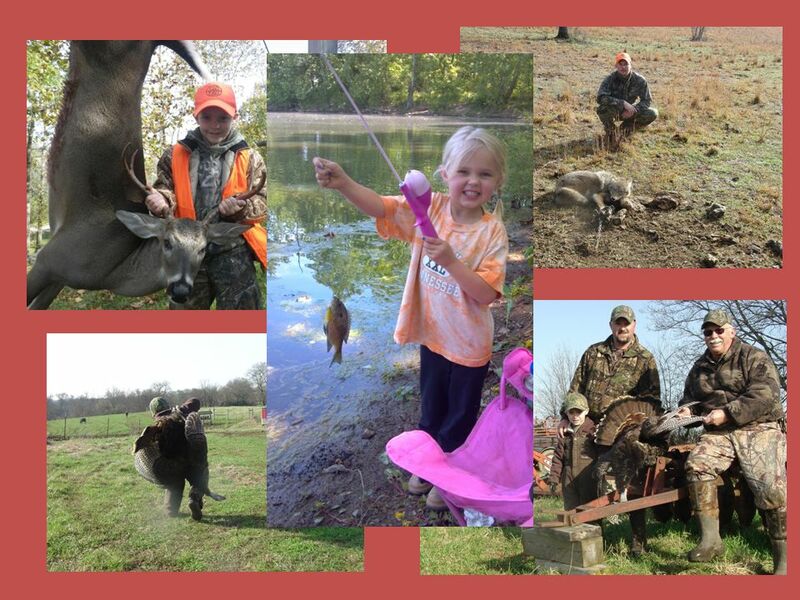 Talk to your local District Conservationist, Extension Agent, State Game and Fish Biologist, Co-op representative. The money is out there, you just have to find it! 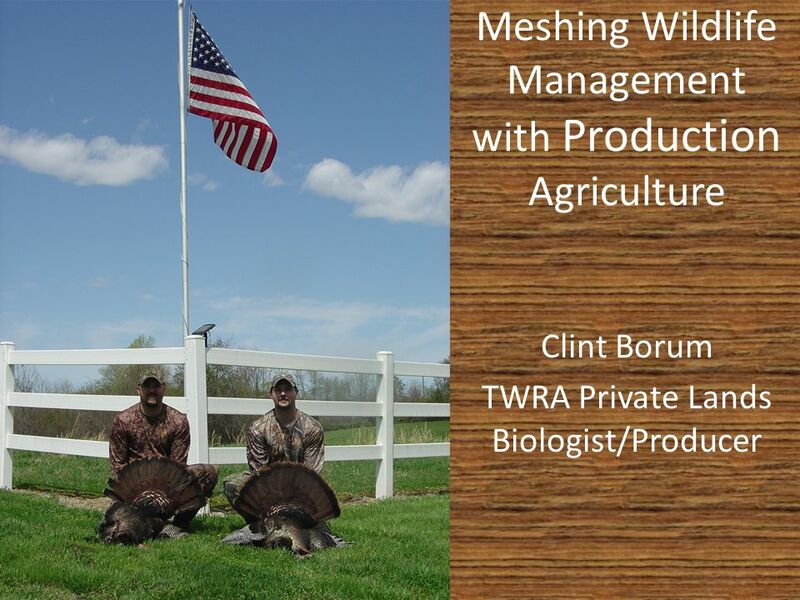 Download ppt "Meshing Wildlife Management with Production Agriculture"
Attracting Illinois Wildlife On Private Lands. Illinois Wildlife Needs 95% of Illinois is privately owned. Wildlife depend on private landowners for habitat. Gary Bates Professor Plant Sciences. 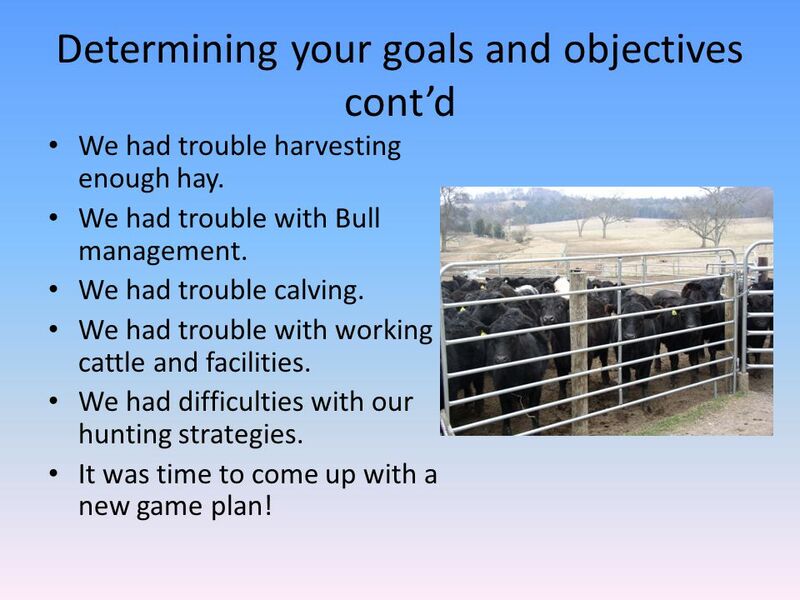 Goals for forage program Graze as much as possible Spend as little money as possible. Module #6 Forage Selection Pine Silvopasture in the Southeast. Tim Reinbott University of Missouri Bradford Research and Extension Center. Module #7 Other Benefits of Silvopasture Pine Silvopasture in the Southeast. Jake Stuckey.  Cover Crops: Are crops planted between main crops to prevent erosion or to enrich the soil. A Cocktail cover crop is a mixture of different. 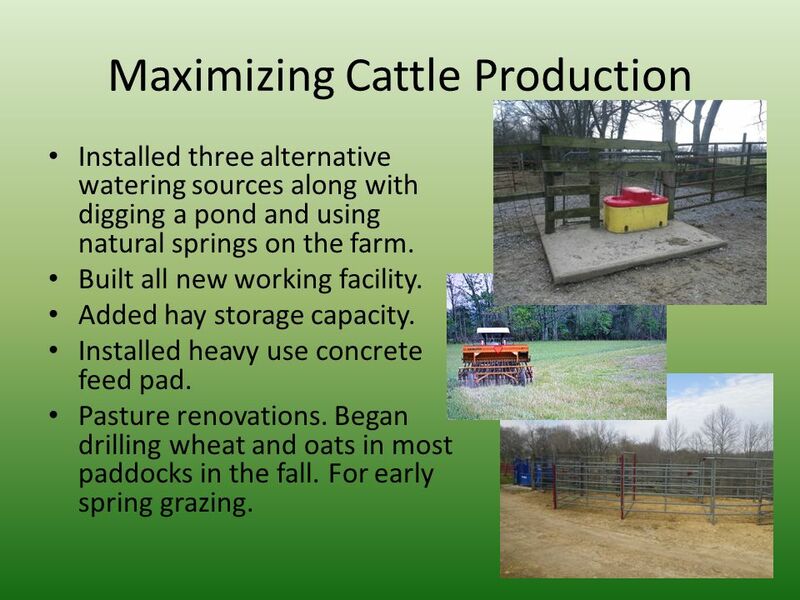 MAKING FORAGES WORK IN TODAY’S PRODUCTION ENVIRONMENT Jon Repair Extension Agent, Crop and Soil Science Virginia Cooperative Extension. USDA Conservation Programs Sorting Out the Pieces: A Conference for Women Landowners Protecting Your Farm’s Soil & Water March 1, 2013. 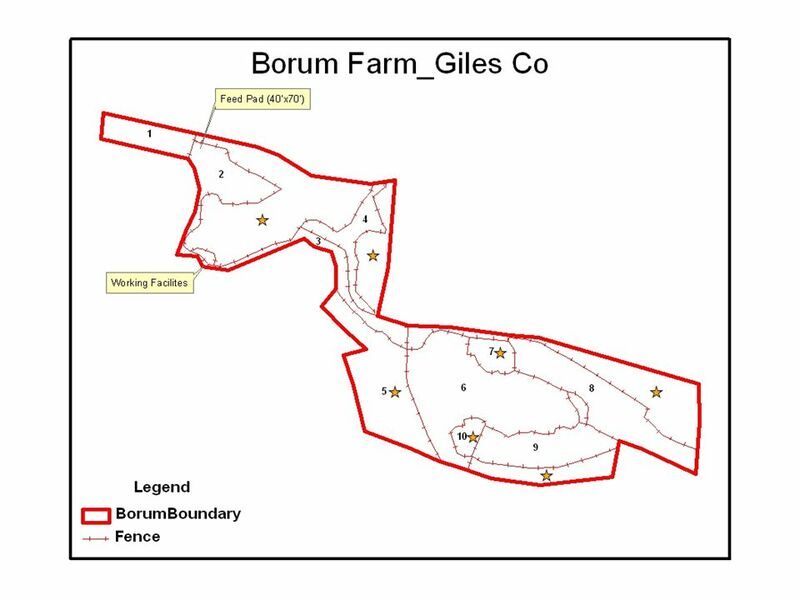 Conesus Lake – Upstream Changes Maxwell Farms Farm plan developed by Nathan Herendeen, Nancy Glazier, John Hanchar, and the Maxwell Brothers. WMA and AMA Programs Implementation of Public Land Development Programs Lessard Outdoor Heritage Council Dennis Simon, DNR Wildlife Management Chief January. Wildlife CDE Plant Identification Wildlife CDE. Cherry zMay have black spots poisonous to most animals when it wilts – grows most everywhere. In your assigned groups: 1.You will be loaned $ You must set aside $200 (transportation) and $300 (living expenses) each round (year) 3.You must. Increasing Forages While Decreasing the Cost of Production Jim Burrus Indian Creek Farm Grass-Finished Beef. CROP HUSBANDRY 5.1 Describe the major cropping systems. Farm Bill 2002: What’s in it for you?. 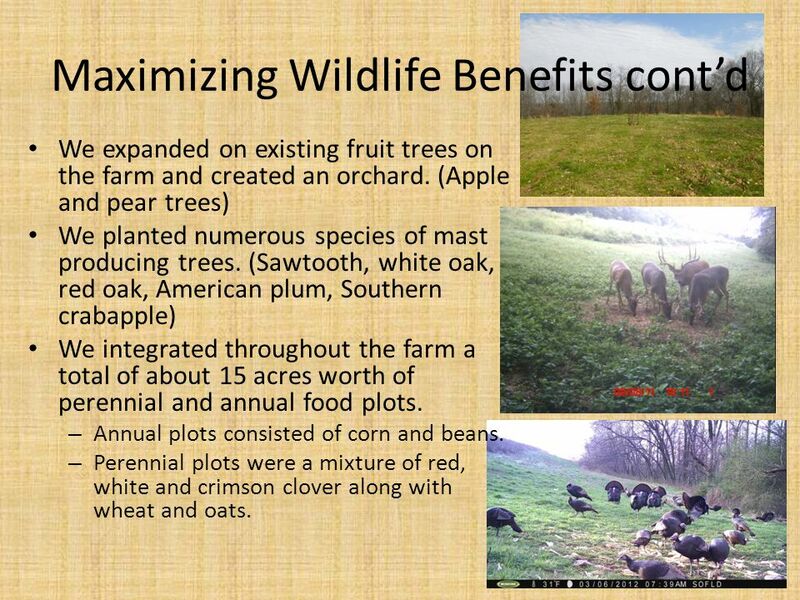 conserving croplands improving water quality managing for wildlife 2002 Farm Bill: What’s in it for you? Grassland – Part 4 Grassland Management.  Good Grassland Management involves the following: 1. Finding out the amount of herbage required. 2. The application. Crop Rotation Growing the same crop in the same place for many years drains the soil of certain nutrients. Crop rotation gives various benefits to the. Nursery Production 3 Commercial Plant Production. Weed Management Strategies Lily Lake Organic Farm Maple Park, IL Dave Campbell.